The story of your paternal-line ancestry is the story of an extraordinary migration. Over 300,000 years and 10,000 generations, Dad’s male-line descendants have rolled over land and sea, hunted mammoths, created pottery, forged iron and survived an Ice Age. And today, the genetic voyage leads to the person reading this blog — you! Through 23andMe’s new and improved Paternal Haplogroup report, customers* can trace the footsteps of their paternal-line ancestors over thousands of generations of human history. And that should be music to the ears of anybody interested in their family’s unique history. What is a Paternal Haplogroup? The most obvious artifact of your paternal ancestry may be your surname. But surnames are actually a pretty recent invention, and names change over time as records are rewritten or lost. For some cultures, even the concept of a paternal surname is foreign. Genetics offers another way to discover your paternal-line history that doesn’t depend on a paper trail. And it can tell a story that reaches back hundreds of thousands of years. Each generation, fathers pass down copies of their Y chromosomes to their sons. So if you are a genetic male, you inherited your Y chromosome — and all the genetic markers it contains — from the unbroken line of men in your paternal lineage. Alone, this doesn’t reveal that much about your heritage. 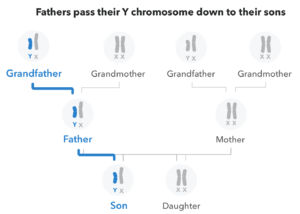 But by comparing the genetic markers on Y chromosomes from men all over the world, researchers have built a genealogical tree of all paternal lineages. This tree reaches back more than 275,000 years to just one man who lived in East Africa: the most recent paternal-line common ancestor of all humans living today. Your paternal-line “haplogroup” describes how your lineage is related to all the others. Each haplogroup is a family of lines that descend from a common ancestor. In the Paternal Haplogroup tree, this is represented by a branch or a cluster of branches. To trace your ancient paternal-line history, we can follow the path from the root of the tree out to your particular branch. And, just as you and a first cousin are connected through your grandparents, you and many others around the world are connected through the common ancestor of your haplogroup. If your lineage carries haplogroup R-M405, for example, you and King Henry IV of France can trace your paternal lines back to the father of haplogroup R-M405. Researchers can discover the geographic origins and migrations of some of our paternal-line ancestors by comparing where different haplogroups are found around the world and how they are related to each other. All of our stories begin at the root of the haplogroup tree in eastern Africa. For over 200,000 years, our ancestors hunted ancient gazelle across the seas of grass and split into diverse groups within Africa. Then, sometime around sixty thousand years ago, one small group crossed the Red Sea and forged new paths across all of Eurasia. In the new Paternal Haplogroup report, customers follow the major migration routes of their paternal lineage, branch by branch, over tens of thousands of years. With major improvements in technology, geneticists are unraveling more of our ancestral mysteries. One prime example is the origin and spread of haplogroup R — the dominant paternal haplogroup in western Eurasia. In the early 2000s, the available evidence suggested that men bearing haplogroup R reached their prominence after surviving the last great peak of the Ice Age nearly 20,000 years ago. But just in the last several years, researchers using DNA extracted from the remains of men who lived in Central Asia and Europe thousands of years ago have connected the recent spread of haplogroup R to men who swept down from the steppes only 5,000 years ago. These migrations began with an early Bronze-Age culture called the Yamnaya. They were herders, and needed to travel fast to keep their livestock fed. 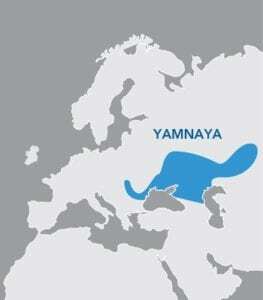 Atop the world’s first domesticated horses and armed with some of the earliest bronze tools and weapons, Yamnaya men spilled east into Central Asia and west into the Balkans. Their descendants eventually stretched from the British Isles to India. In addition to their technology and paternal lines, the Yamnaya also brought their language. This language was the ancestor of the Indo-European language family, a group that includes 445 living languages spoken historically from the western tip of Europe to central and southern Asia. With the technology to extract ancient DNA and sequence the entire human genome, new doors are opening in the study of human population history and the pace of new discoveries about our ancestors is accelerating. What’s more, researchers from all fields have a new set of tools: people like you. From professional genealogists to beginner hobbyists, individuals are researching their family histories and sharing data like never before. As geneticists, genealogists, and citizen scientists work together to uncover new evidence and gain new insights, new details will be added to all of our ancestral stories. * Because genetic females do not have Y chromosomes, 23andMe is unable to directly determine the haplogroup of their paternal line. Female customers can, however, link accounts with a brother or father to receive their paternal haplogroup results.